Solo travel. It’s the dream of many students seeking adventure and the nightmare of their parents who are oceans away, worried if their son or daughter is going to survive the experience. During Spring Break I decided that the dream outweighed by parent’s potential nightmares. After spending a week in the Andalusia region of Spain with the St Andrews History Society, I returned to St Andrews for an eight-hour laundry stop before racing to Edinburgh Airport to start my 10-day solo trek across Iceland and Fenno-Scandinavia. First stop: Reykjavík, the northernmost capital city in the world. Just like the rest of Iceland, Reykjavík has two distinct characteristics: it’s small and it’s absolutely beautiful. 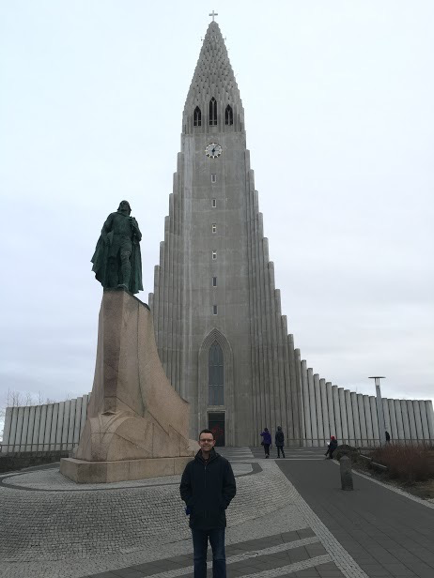 From the famous Hallgrímskirkja church which dominates the skyline to the modern national concert hall, the Harpa, Reykjavík boasts impressive feats of architecture for a city of just over 100,000. L: The Harpa Concert Hall. R:The Hallgrímskirkja Church in Reykjavík. After exploring the main streets of the city, a feat that can be accomplished in just a matter of hours, I prepared for a much busier day two.Having booked my tour in advance, I was picked up from my hostel at 9am for the famous “Golden Circle Tour” which, in nine hours, covers some of the most magnificent sights in southwest Iceland.Our coach passed through the rocky and snowy Icelandic countryside before arriving at the Haukadalur Geothermic Valley which is home to the famous Strokkur geyser which sends a jet of scalding hot water 15 to 20 meters high every 8-10 minutes. Next stop was the magnificent Gullfoss Waterfall which races 140 cubic meters of water from the Hvítá river every second over its 32 meter drop, creating one of the most spectacular sights I saw during my time in Iceland, and perhaps the whole Scandinavian trip. The last stop, but certainly not the least, on the Golden Circle Tour was the Þingvellir National Park (anglicised as “Thingvellir” as the character “Þ” creates a “Th” sound). Home to the first “Althing” Parliament meeting in 930 A.D., Þingvellir National Park held the first parliamentary body in Iceland. Today, Þingvellir National Park is a remarkable place to visit as you can clearly see the break in the tectonic plate divide between the Eurasian and North American tectonic plates. This area was recently and famously broadcasted for its geothermic and volcanic activity which led to the 2010 Eyjafjallajökull Volcano eruption that shut down European air travel. By day three of the trip, I was on an SAS flight over the Norwegian Sea to the capital of the country which had controlled Iceland until 1944: Oslo, Norway. Notorious for being beautiful but expensive, Oslo lived up to both these evaluations. After arriving at Oslo Airport in Gardermoen around 20 miles north of the city, you board the “Flytoget” Train which whisks you southward to the Norwegian centre at over 130 mph. Arriving in Oslo Central Station gives you an amazing first impression of the city. Walking out onto the famed Karl Johans Gate you are led from Central Station straight up to the Norwegian Royal Palace just over a kilometre away. On route, you pass the Norwegian National Theatre, the University of Oslo, and many famous hotels and shops which have catered to locals and tourists alike for decades. The next day started off with a ferry to the Bygdøy region of the city which is home to many of its most famous museums: Oslo’s greatest attractions to a history student/general museum geek such as myself. Home to four stunning examples of Viking burial ships, the Viking Ship Museum is one of the most visited places in the city. Also located in Bygdøy is the Fram Polar Ship Museum which has the polar explorer ship “Fram” on display, alongside other artefacts from the Norway’s 19th and 20th century arctic and antarctic exploration. Another spot in Oslo that cannot be missed if you are an English student or someone with an interest in performance art is the home of the famed Norwegian playwright, Henrik Ibsen. After a tour of the small museum, you are led into the writer’s former apartments where he lived and worked on such works as Hedda Gabler and A Doll's House. 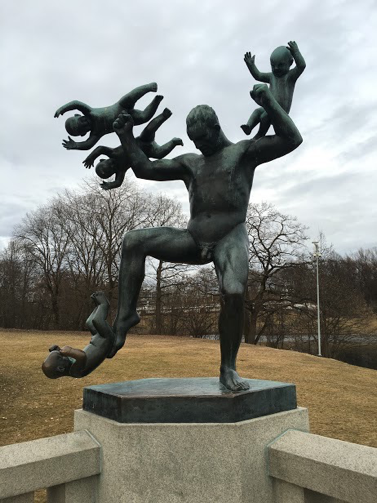 A truly bizarre experience I had in Oslo was my visit to the famous Vigeland installation at the Frogner Sculpture Park, a permanent sculpture installation created by Gustav igeland between the 1920s and 1943. Mind boggling statues of adult and child human figures in the most bizarre arrangements and positions proliferate throughout the park leading up to a central monolith of human forms that is quite a sight to behold…. One of the beautiful preserved Viking burial ships, The Norwegian Arctic Explorer Ship “Fram” and artworks by Gustav Vigeland. After a 45 minute flight to Arlanda Airport, I found myself on yet another train racing me southward toward another Scandinavian capital: Stockholm. Stockholm was both the city I stayed the longest in and the city which I enjoyed exploring the most. The city is so called “Venice of the North” thanks to the canals, which separate the 14 islands that form the capital. Sweden as a whole is one of my favourite weekend destinations. My first semester in St Andrews saw me heading to Göteborg and Malmo in October and November respectively. I started my first day in Stockholm by visiting the Swedish Royal Palace: The Kungliga Slottet. The current palace dates back to 1697 after the previous Swedish royal stronghold burned to the ground. From the grand halls to the Royal Treasury which has the Swedish Crown Jewels on display, the entire palace, home to Swedish King Carl XVI Gustaf, is one of the largest in modern Europe and possibly one of the most beautiful. Next was the Vasa Museum, the single most breath-taking stop on the entire trip. Picture a scene in 1628 when the largest, newest, and most state of the art addition to the Swedish Royal Navy sailed into Stockholm Harbour from its shipyard, travelled around 1,300 meters, then promptly floundered and sank. Fast forward over 300 years later when the near-intact wreck of the Vasa was rediscovered at the bottom of Stockholm Harbour and was raised to the surface, preserved, and put on display: the only 17th century warship this intact. In the same neighbourhood of the Vasa Museum is the recently opened ABBA Museum. The history and music of the Swedish super band and 1974 Eurovision winners have been immortalised in an underground museum just a few hundred yards from the coastline of Stockholm Harbour. Although I was tempted, I didn't partake in the hologram ABBA recreation where I could have been “ABBA’s 5th member. My final day’s lunch in Stockholm was at the Östermalms saluhall, translated as the “Östermalms Food Hall,” which is a short walk north from the harbour ferry port in the centre of the city. Built in 1888 and home to several different indoor food vendors, the saluhall is a great way to get a taste of traditional Swedish cuisine without having to travel around searching for different restaurants. Images of the Main bell tower of City Hall, the “Blue Hall” of City Hall used for the annual Nobel Prize Banquet, the “Golden Hall of City Hall used for the annual Nobel Prize Ball and Östermalms saluhall (foodhall). Having never taken a cruise, I was eager to try new forms of transportation during the solo portion of my Spring Break trip. So for my journey from Stockholm to my final stop, Helsinki, I booked a cabin aboard the Viking Line’s M/S Gabriella, a 2,400 passenger cruise ferry which makes twice weekly overnight journeys from Stockholm to the Finnish capital across the Baltic Sea and up the Gulf of Finland. Leaving Stockholm’s ferry harbour at 4:30 p.m., we sailed through the night, making Helsinki just after 10:00 the next morning. The journey was smooth and consisted of nothing but sleeping and eating at the ship’s lavishly appointed dining hall as I neglected to tour the ship’s casino or nightclub. I had a rude awakening the morning of my arrival into Helsinki when the ship’s general alarm sounded, however the “This is only a drill” disclaimer” was only delivered in Swedish and Finnish. After a quick run upstairs in my bright orange life vest, I quickly realised my mistake and walked back to my cabin in the most bizarre walk-of-shame I’ve ever had to take…. After eight days of trekking across Scandinavia, I managed to survive the trip and reach my final stop, Helsinki, Finland. Straight after departing the M/S Gabriella, I headed to the downtown harbour ferry docks where I took a 20-minute transfer to the Sea Fortress, and UNESCO World Heritage Site, Suomenlinna. A battle encampment on the island sea fortress, Suomenlinna, in Helsinki. Some of the more amazing sights of the Finnish capital were the Kamppi Chapel and Temppeliaukio Church, both part of the Church of Finland and both breathtaking feats of engineering and architecture. First, the Kamppi Chapel is made entirely of wood and creates a silent space in the centre of one of the busiest squares in Helsinki. The Temppeliaukio Church, often simply called the “Rock Church,” was constructed in 1968-69 out of solid rock. Its walls are left uncovered, revealing the solid stone construction which is bathed in natural light which flows in from the copper, circular ceiling. At the end of my journey, I found myself the furthest I’ve ventured from St. Andrews during my Spring travels, Helsinki. A 2 hour British Airways flight found me in London Heathrow where, due to the day’s storm, I was stranded for 3 hours, thankfully the only major travel disruption of the trip. Landing in Edinburgh just before 11:30 p.m. caused me to miss the last shuttle to St Andrews, potentially stranding me at the airport until the next morning’s first train. But then my phone buzzed. My friend Marykate was calling to let me know that she, and three other of my best friends and fellow John Burnet Hall residents had raced through the Fife countryside in my friend Izzy’s car to rescue me on the last leg of my journey. After an unsurprisingly tearful reunion and a speedy trip across the Forth and through Fife, I was home. After surviving four countries, 10-days, 3,921 miles, and 9.5 hours of flight time, my trip was at an end and I had a chance to reflect. Travel, in its very essence, is an education. When you travel and expose yourself to new places and new things and new experiences, you open your eyes to the world just a little wider. Solo travel, in its very essence, is an education about yourself. When you travel alone, left to your own devices while trekking across cities, countries, and boarders, you have a unique opportunity to reflect on who you are and what you value as a person. Head to a museum and experience local culture or head to a sculpture garden and enjoy what little sunlight Oslo in the early spring has to offer? Splurge on some potentially gastro-intestinally disastrous Icelandic seafood or resign to the comfort of ordering a meal you’ve had hundreds of times before?Run to the lifeboat deck of that ferry or just trust your limited Swedish skills weren’t wrong when you thought you heard “this is a drill”? Travel helps you reprioritise, to refocus on what you value and what you enjoy. And, at the end of your trip, travel reminds you why you love where you call home.